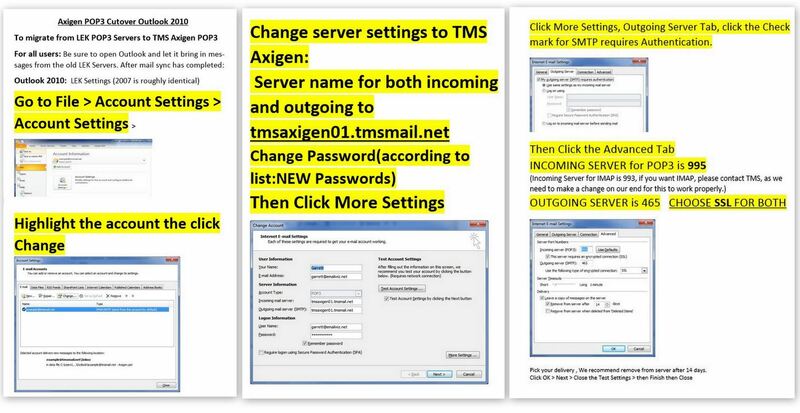 As part of our commitment to remain on the cutting edge of technology, TMS is pleased to announce that we are have invested in upgrading our entire Email System, to commercial grade servers and the top of the line Remote Email software, AXIGEN, to replace the current Roundcube qmail. This new system will help us provide the extraordinary customer service you have come to expect, while enabling us to offer the most up-to-date products and services. Quite frankly, with all of the new ways people use to access email, by laptops, phones and ipads, LEK Internet Services outgrew the technology that had been in place. With the upgrade, there are some changes that will affect the and services we provide to you. We want you to be aware of these changes and ask that you read this letter carefully to help ensure the transition causes you as little disruption as possible. We expect there will be short duration outages during the scheduled migration. Your domain name ie, youremail@tmslink.com will NOT change. Your email address will NOT change. Each email address has assigned a new secure password for the migration. You may opt to change your password, if you wish. There will be changes to your server and port settings in Outlook on your computer. If you check email on your phone, you will need to update that as well. (Detailed instructions are included in this communication. We are migrating customers off the old LEK servers over to the new TMS servers. If we registered your domain name, or host your website, and have access to the administration of your domain name, we have made the changes here already. If you registered your domain name yourself or host elsewhere, we will need contact with your IT person, to change the name servers for your domain (most likely GoDaddy or Network Solutions). (send contact info to bunny@calltms.com). The next step is to schedule a time for the actual migration. After TMS makes the actual cutover to the new servers for your domain, your email will be down until the changes are made to the settings in your email client, ie Outlook, your phone etc. Once the steps are followed to synch up with the new server, you will have completed the migration to the new email system. A member of TMS staff will help walk you through the steps, if you need additional help, from the instructions that are attached. You will NOT lose any emails that you currently have on the server or on our computer, if the instructions are followed. If you have any questions, please feel free to call the TMS office at 330-762-9344 or email us at bunny@calltms.com. Thank you for your patience as we migrate the existing LEK email clients to the new TMS system.